Dysfunctional teams after harassment issues or reorganisation? Leaders who don’t have the trust and respect of their team? Boring meetings and Presentations without Punch? 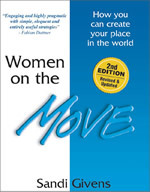 Download your complimentary sample of my book "Women on the Move: How you can create your place in the world"